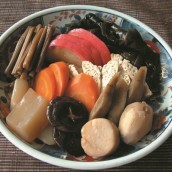 A hot pot with satoimo, konnyaku, negi, mushrooms and seasonal vegetables. 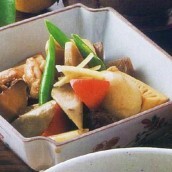 It is said that this dish was originated in the Edo Period and has roots in cuisines from Kyoto which came in through a cultural exchange in the Edo Period. 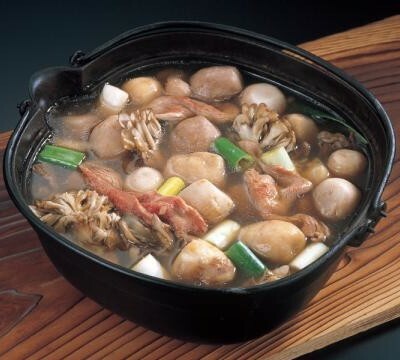 “Imoni kai” is a traditional event in that area, which has a long history of more than 300 years, where people get together around a big satoimo hot pot and eat. 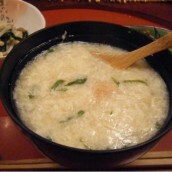 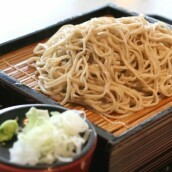 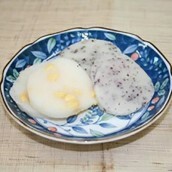 Since satoimo is in season when the rice harvest season is almost done, it has been a staple food in the area, and used for “imoni kai” for rice harvest festivals and local exchange events. 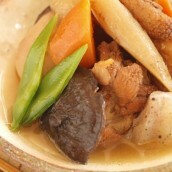 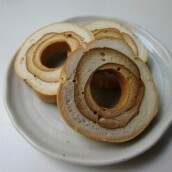 The flavor of Imoni differs depending on the areas – the one in Shonai area uses pork and is seasoned with miso, and the one in Nairiku uses beef with shoyu-based seasoning.